The index opened flat to positive but profit booking saw the index dip below 7800, but value buying saw the index close strong at 7860.75, gain of 45.85 points. The broader market was flat with 761 advances to 787 declines. Range for the series is at 7600-8000. 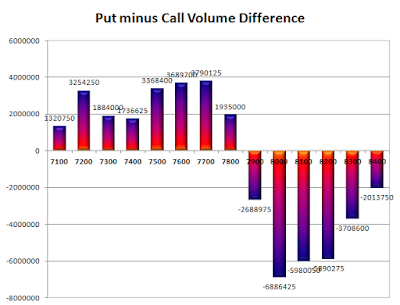 Call option 7900 added 2.29 lacs OI with short covering at 7800 and below strike prices. Put option 7900-7500 added 13.81 lacs OI with short covering at 8000 and above strike prices. 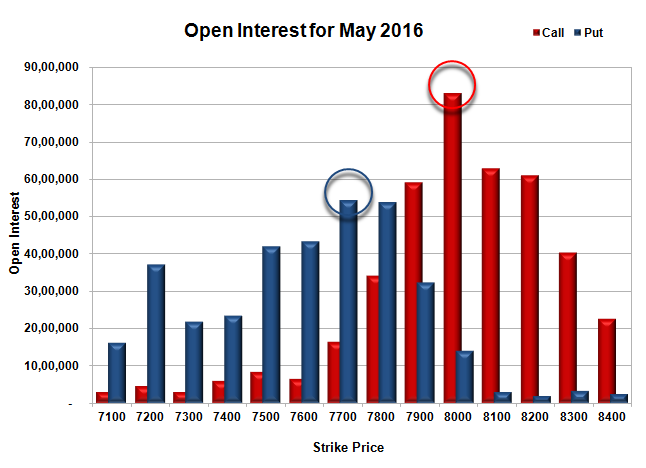 Nifty Open Interest is at 1,61,98,875 down by 87,525, with increase in price, probably short covering. 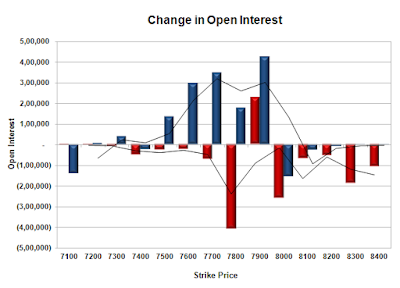 Bank Nifty Open Interest is at 16,68,150 down by 46,320, with increase in price, probably short covering. FII’s sold 3259 contracts of Index Futures, which includes net 2210 contracts long liquidation and 1049 contracts short build-up, with decrease in net OI by 1161 contracts, includes 29808 longs to 33067 shorts for the day. FII’s Index future open contract as on date is 132501 Longs to 96997 Shorts, Net 35504 down by 3259 contracts. 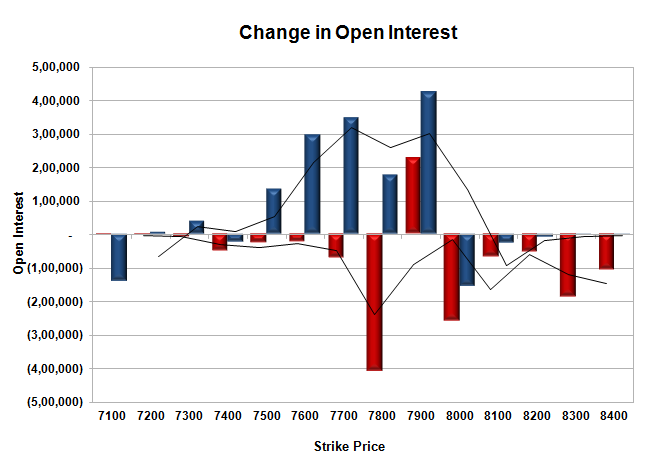 Initial support at 7800, with OI of 53.67 lacs and below that at 7700 with OI of 54.31 lacs. Initial resistance at 7900, with OI of 59.09 lacs and above that at 8000 with highest OI of 82.93 lacs. Day Range as per Option Table is 7773 - 7911 and as per VIX is 7791 - 7931 with 7836 as the Pivot.